I thought your readers might be interested in seeing photos of a berry-picking cart that's æfoot-powered' by the operator. I built it almost entirely out of old bicycle parts," says Francis Voegeli, Jefferson City, Mo. The operator lays down on the cart to pick but moves himself down the row with a pair of foot paddles that drive bicycle sprockets and chains. "I use it to pick strawberries, transplant seedlings, and for weeding. I'm 77 years old, so at my age bending over the row for hours is a problem," says Voegeli. The 4-wheeled cart was built with parts from five different bicycles. The frame is made of 1-in. sq. tubing. The wheels came off a pair of bicycles. A shaft across the back is fitted with small sprockets at either end that chain-drive a set of sprockets above the rear wheels. A pair of 6-in. sprockets mount next to two paddles at the center of the shaft. The spring-loaded pedals have metal "teeth" on them that act like ratchets against the sprockets. To go forward, Voegeli says he paddles his feet like on an old-fashioned sewing machine. "I just put my toes in the stirrups and flex my ankles and toes back and forth to get a bite on the ratchets that engage the sprockets." Voegeli used 20-in. bike wheels which he says suited his arm reach. "A taller person might want to use 24 or 26-in. wheels," he says. The cart's front wheels are tied together by a pair of clevis-ended metal rods that attach to a metal strap at the middle part of the frame's front end. "I do very little steering with this machine," says Voegeli. "The front wheels move only 3 in. from side to side. To change direction I just grab one of the wheels. When I get to the end of the row, I pick up the front end of the cart and turn it around to go back the other way. "I support my head on a headrest on which my wife sewed a breatheable terry cloth towel in order to soak up sweat. The main part of the board is 18 in. wide, but the part under my chest narrows to only 14 in. in order to avoid restricting my arm movements," says Voegeli. Plywood platforms positioned down low on both sides hold baskets or flats. "Some people who see it for the first time tell me they think it's the silliest thing they've ever seen, but it works and they have to admit that. Last year I used it to pick 54 gal. of berries off my 200-ft. row of strawberries." Contact: FARM SHOW Followup, Francis N. Voegeli, 3231 Moreau View Dr., Jefferson City, Mo. 65101 (ph 573 634-4486). "Lay Down" Berry Picking Cart Built From Bicycle Parts CROPS Miscellaneous 30-2-44 I thought your readers might be interested in seeing photos of a berry-picking cart that's æfoot-powered' by the operator. I built it almost entirely out of old bicycle parts," says Francis Voegeli, Jefferson City, Mo. The operator lays down on the cart to pick but moves himself down the row with a pair of foot paddles that drive bicycle sprockets and chains. "I use it to pick strawberries, transplant seedlings, and for weeding. I'm 77 years old, so at my age bending over the row for hours is a problem," says Voegeli. The 4-wheeled cart was built with parts from five different bicycles. The frame is made of 1-in. sq. tubing. The wheels came off a pair of bicycles. A shaft across the back is fitted with small sprockets at either end that chain-drive a set of sprockets above the rear wheels. A pair of 6-in. sprockets mount next to two paddles at the center of the shaft. The spring-loaded pedals have metal "teeth" on them that act like ratchets against the sprockets. To go forward, Voegeli says he paddles his feet like on an old-fashioned sewing machine. "I just put my toes in the stirrups and flex my ankles and toes back and forth to get a bite on the ratchets that engage the sprockets." Voegeli used 20-in. bike wheels which he says suited his arm reach. "A taller person might want to use 24 or 26-in. wheels," he says. The cart's front wheels are tied together by a pair of clevis-ended metal rods that attach to a metal strap at the middle part of the frame's front end. "I do very little steering with this machine," says Voegeli. "The front wheels move only 3 in. from side to side. To change direction I just grab one of the wheels. When I get to the end of the row, I pick up the front end of the cart and turn it around to go back the other way. "I support my head on a headrest on which my wife sewed a breatheable terry cloth towel in order to soak up sweat. The main part of the board is 18 in. wide, but the part under my chest narrows to only 14 in. in order to avoid restricting my arm movements," says Voegeli. Plywood platforms positioned down low on both sides hold baskets or flats. "Some people who see it for the first time tell me they think it's the silliest thing they've ever seen, but it works and they have to admit that. Last year I used it to pick 54 gal. of berries off my 200-ft. row of strawberries." 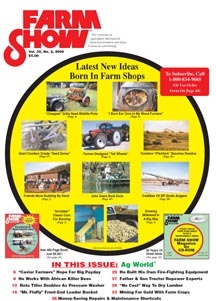 Contact: FARM SHOW Followup, Francis N. Voegeli, 3231 Moreau View Dr., Jefferson City, Mo. 65101 (ph 573 634-4486).